Parts manufacturers use Flex-Hone® tools to remove burrs and improve cylinder surface finish at the same time. Made in the USA by Brush Research Manufacturing (BRM), Flex-Hone® tools improve part quality, reduce costs, and increase speed and efficiency. As the following success stories show, Flex-Hone® tools help solve metal finishing challenges with pumps, compressors, and valves. BRM’s flexible cylinder hones are also used in the chamfer blending of aerospace parts, and in lawn equipment manufacturing. Haskel Inc. wanted a more cost-effective way to remove burrs from pump sleeves. Instead of paying a job shop to improve cylinder surface finish, the pump manufacturer began using BRM Flex-Hone® tools in-house. By eliminating outsourced deburring, Haskel enjoys a significant cost savings while maintaining stronger quality control. Copeland Corporation wanted a faster way to deburr the head decks on air compressors. By using the Flex-Hone® with a handheld power tool, the compressor manufacturer removes burrs at the surface of the cylinder head that could limit gasket sealing and cause the compressor to leak. Thanks to Flex-Hone® technology, each deburring operations takes just two seconds – a significant cost savings. Humphrey Products wanted a better way to deburr valve bodies used in transmission systems. By using BRM Flex-Hone® tools, the valve manufacturer did more than just remove burrs and improve surface finish at the same time. Humphrey Products also improved part quality, reduced waste, and increased manufacturing throughput. 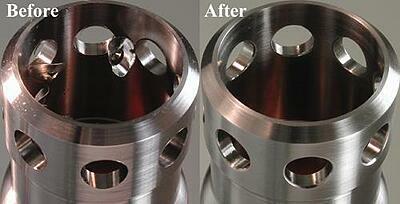 Heuele Tool needed a superior surface finish for the through-holes in jet engine components. That’s why the aerospace manufacturer started using flexible cylinder hones for the final deburring and surface finishing of chamfered through-holes. BRM’s Flex-Hone® tools for chamfer blending round the transition between beveled edges and through-holes. Ryobi Powered Products wanted to cut deburring costs and boost product quality. That’s why the lawn trimmer manufacturer uses Flex-Hone® technology to remove burrs and improve the surface finish of cylinder walls. By using flexible hones with semi-automatic machinery, Ryobi Powered Products found a surface finishing solution that also speeds operations and increases throughput. Are you ready to learn more about how Flex-Hone® tools can save you time and money? If you’re at EMO Hannover this week, visit BRM in Hall 11, Booth A47. You can also contact your local BRM representative or download the Flex-Hone® Resource Guide, the ultimate source of information about BRM’s metalworking tools for cylinder deburring and surface finishing.